By request, here are The DeZurik (Cackle) Sisters. Thanks goes out to Uncle Bri (of 'Uncle Bri's Early Morning Funhouse' radio show) for this compilation. All tracks are sourced from 16" transcription discs for the Checkerboard Time Radio Show (circa 1940s?). Three songs (1, 2, 10) were featured on the 2003 365 Project. If you have any requests for full albums of individual cuts that were featured in 2003 leave your comment requests here. If we have it, we will try to get it uploaded for you. In 2003 due to limited server space we would serve up a track a day, but now we can supply you with more, so send those cards and letters in! These women are AMAZING!! holy crap!! This is demented genius, yet somehow very sweet. I love it! I would love the 2003's entire album of "picking up girls made easy". That would be most beautiful. Thanks Uncle Bri and otis, this is tremendous! 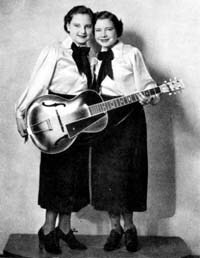 WFMU has played one track by the Dezurik sisters, but this is the motherlode! Bless you all! I'd really love the whole "Soundies" broadcast. Either that or a different one! That was wonderful!!!!!! If anyone has access to their appearance in 1940's "Barnyard Follies" (Republic Pictures) do tell! Many thanks for this, really transporting pieces of music. I have loved 'The Arizona Yodeler' for many years - it's available on Trikont's 'American Yodeling 1911-1946' amongst some other fine examples of mountain throat oscillation. Track 16, are you sure it's called "I Love A Little Whale"? Because it sure as hell sounds like they are singing "I Love little Willy" to me. Is there any more of George Garebedian and the awful trumpet of Harry Arms (i.e. beyond 2003's Hooray For Hollywood / Spanish Flea)? I'm a sucker for kid's records and corny novelties so I'd be happy to see full postings of the Tunetwisters (Nov 7), The Peter Pan Orchestra and Chorus (June 5) or the Casper LP (October 4). MORE of George Garebedian and the awful trumpet of Harry Arms, along with a slew of Tijuana Brass Sounding bands on a day (in the works). and will contact the original contributors to try to get other full recordings. How about the entire "Music to Suffer by" album by Leona Anderson? Dear lord, if you could post the entire Dean Milan album i would have a heart attack of love. Yes, track 16 of the Cackle Sisters is the old song, "I Love Little Willie", not "I Love A Little Whale". Mixups like this are easy to misunderstand when you listen to old recordings. For years I thought the old Christmas song had the line, "While Shepherd's Washed Their Socks By Night". An elderly neighbor of mine asked me where in the Bible it talked about the "Sino". I asked her what she meant and she said, "Well, we always sang, "Jesus loves me, the sino", and I never knew what a "sino" was". Yep, ya gotta be careful when listening to some lyrics. Track 16 is updated with the correct title "I Love Little Willie"
any more music by Gen Orange? the 2003 post mentioned an a-side, "My Treasure." Hi, can somebody tell me if I can buy a CD of the Dezurik Sisters with all the Titles I found on that wonderful page...? I too would like to buy a Dezurik Sisters CD if possible. Please let me know if I can. Hello, everyone! At my brother's advice, I looked up this site, and am compelled to write to you, also. I am Mary Jane DeZurik's and Augie Klein's oldest child and only daughter, Janice Marie. I, too, still reside in the Chicago area and am elated to hear about the many fans who still want to listen to our Mom's and Aunt's unique style of music! As my brother, Jim Klein, has requested, I, too, would love to have a CD of all 32 recordings from the Checkerboard Time Radio Show. We are also looking for a copy(s) of the movie "Barnyard Follies". If anyone out there knows how we can obtain this movie, please let us know. Unfortunately, our Mom, Mary Jane, and our Aunt Carolyn, didn't have any records of their songs, nor did they have a copy of the movie they performed in. Please let us know! We appreciate and thank you in advance for any information you can give us about this. Happy Holidays!